We were on this ship for the 8-night 2018 Christmas Cruise departing Ft. Lauderdale with stops in Nassau, Puerto Rico, St. Maarten and St. Kitts. This was the second Christmas cruise for us on this ship, the last one 4 years ago out of San Juan, PR. Overall, this was our 5th cruise on RCL and our 8th cruise overall. We are an active couple in our early 50’s and were traveling with our 2 daughters and son in-law, all in their early 20’s. We checked in early (11am) and were allowed to board the ship immediately. This was very nice compared to our previous cruise on Norwegian where we had to wait in a waiting area for more than 1 hour. Luggage drop and check-in was painless, but I had also completed all the cruise documents including pictures online ahead of time. We had lunch at the Windjammer Café and then relaxed in the Blue Moon (Deck 14) until the rooms opened at 1pm. We had 2 Balcony Staterooms (8246 and 8250). One was a bit larger than the other and had a sofa bed vs. the Pullman (overhead bed) in the other. Overall the cabin was clean, the beds comfortable and plenty of space to store all our stuff, including scuba gear. The balconies on this ship are a lot more “closed in” than on newer ships, but we knew this from our previous cruise. We opted for My Time dining since the 5:30 seating was too early and the 8:30 too late for our liking. I did make 6:30 reservations for us ahead of time and we asked for a quiet table near a window at our first seating which we were given. We were very happy with this location and with our wait staff, so we then asked to have this table request in our profile for all of the following nights. The check-in person (Rene) did his best to accommodate this request and we were able to get that table all nights except one where he went out of his way to find us another quiet table by a window. The food in the dining room was good for most evenings, some were great and a few were just OK. Overall, I would rate the food a 7/10, the wait staff a 10/10. Bar service in the dining room could be a bit slow. We liked the elegance and lighting of the dining room better than those on Norwegian Escape. Our daughter and Son-in-Law had specialty dinners at Izumi and the Italian restaurant and felt that they were very special and slower paced. We did opt for the drink package which, for us, makes the shipboard experience much more relaxing (no stress about drink prices). We felt the wine/beer selection was good, but the mixed drinks were quite weak. We learned quickly that specifying the alcohol (i.e. gold Tequila, dark Rum, etc.) would improve the drink and the bar tenders were happy to comply. We also learned which bar tenders were reasonable with their pours (at Solarium bar we would sometimes see them not even fill a single shot glass of alcohol for the drink) and we would frequent those locations. It was also nice that specialty coffees were included in the package (not true for Norwegian). We attended most performances and game shows and especially enjoyed the comedians and game shows (Battel of the Sexes, The Quest). I don’t know if it was just coincidence, but the main comedian was the same as 4 years ago, but he was still great and only some of this jokes were repeats. Getting seats in the main theater was never an issue, but for the game shows in the Imperial Lounge an early arrival was critical. The guy in the piano bar (all songs by request) was great and the place was always packed. I would rate the entertainment 8/10. We are not the type to lay by the pool, but deck chairs seemed available anytime we walked through the pool area, even more so in the Solarium. We like to walk while on board and really enjoyed that one can circle the complete ship (as long as the weather is not too nasty and they close access to the bow) on deck 4. Most other ships we have been on do not have access to the bow. Some in our group got a massage and enjoyed this except the sales pitch for overpriced stuff at the end. We did not spend any time in the casino or gym. We disembarked early taking our own luggage to assure we would make our return flight. Disembarkation and customs/immigration was much quicker than expected. Overall we rarely felt that this was a Holiday cruise with the ship at capacity (of course the decorations and music were reminders). Ship size was a good compromise in having lots of activities (rock climbing, ice skating, Flowrider, etc.) and open spaces (the promenade) but not the big distances of other larger ships. We did miss the more elaborate shows available on Oasis class ships. All crew members we interacted with were friendly and professional and some really stood out in trying to make our stay as good as possible. There were no incidents that we needed to complain about. Overall I would rate this cruise a solid 8/10. We were on this ship for the 8-night 2018 Christmas Cruise departing Ft. Lauderdale with stops in Nassau, Puerto Rico, St. Maarten and St. Kitts. This was the second Christmas cruise for us on this ship, the last one 4 years ago out of San Juan, PR. 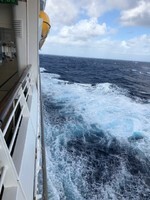 Overall, this was our 5th cruise on RCL and our 8th cruise overall. We are an active couple in our early 50’s and were traveling with our 2 daughters and son in-law, all in their early 20’s. 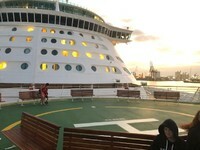 We checked in early (11am) and were allowed to board the ship immediately. This was very nice compared to our previous cruise on Norwegian where we had to wait in a waiting area for more than 1 hour. Luggage drop and check-in was painless, but I had also completed all the cruise documents including pictures online ahead of time. We had lunch at the Windjammer Café and then relaxed in the Blue Moon (Deck 14) until the rooms opened at 1pm. We had 2 Balcony Staterooms (8246 and 8250). One was a bit larger than the other and had a sofa bed vs. the Pullman (overhead bed) in the other. Overall the cabin was clean, the beds comfortable and plenty of space to store all our stuff, including scuba gear. The balconies on this ship are a lot more “closed in” than on newer ships, but we knew this from our previous cruise. We opted for My Time dining since the 5:30 seating was too early and the 8:30 too late for our liking. I did make 6:30 reservations for us ahead of time and we asked for a quiet table near a window at our first seating which we were given. We were very happy with this location and with our wait staff, so we then asked to have this table request in our profile for all of the following nights. The check-in person (Rene) did his best to accommodate this request and we were able to get that table all nights except one where he went out of his way to find us another quiet table by a window. The food in the dining room was good for most evenings, some were great and a few were just OK. Overall, I would rate the food a 7/10, the wait staff a 10/10. Bar service in the dining room could be a bit slow. We liked the elegance and lighting of the dining room better than those on Norwegian Escape. Our daughter and Son-in-Law had specialty dinners at Izumi and the Italian restaurant and felt that they were very special and slower paced. We did opt for the drink package which, for us, makes the shipboard experience much more relaxing (no stress about drink prices). We felt the wine/beer selection was good, but the mixed drinks were quite weak. We learned quickly that specifying the alcohol (i.e. gold Tequila, dark Rum, etc.) would improve the drink and the bar tenders were happy to comply. We also learned which bar tenders were reasonable with their pours (at Solarium bar we would sometimes see them not even fill a single shot glass of alcohol for the drink) and we would frequent those locations. It was also nice that specialty coffees were included in the package (not true for Norwegian). We attended most performances and game shows and especially enjoyed the comedians and game shows (Battel of the Sexes, The Quest). I don’t know if it was just coincidence, but the main comedian was the same as 4 years ago, but he was still great and only some of this jokes were repeats. Getting seats in the main theater was never an issue, but for the game shows in the Imperial Lounge an early arrival was critical. The guy in the piano bar (all songs by request) was great and the place was always packed. I would rate the entertainment 8/10. We are not the type to lay by the pool, but deck chairs seemed available anytime we walked through the pool area, even more so in the Solarium. We like to walk while on board and really enjoyed that one can circle the complete ship (as long as the weather is not too nasty and they close access to the bow) on deck 4. Most other ships we have been on do not have access to the bow. Some in our group got a massage and enjoyed this except the sales pitch for overpriced stuff at the end. We did not spend any time in the casino or gym. We disembarked early taking our own luggage to assure we would make our return flight. Disembarkation and customs/immigration was much quicker than expected. Overall we rarely felt that this was a Holiday cruise with the ship at capacity (of course the decorations and music were reminders). Ship size was a good compromise in having lots of activities (rock climbing, ice skating, Flowrider, etc.) and open spaces (the promenade) but not the big distances of other larger ships. We did miss the more elaborate shows available on Oasis class ships. All crew members we interacted with were friendly and professional and some really stood out in trying to make our stay as good as possible. There were no incidents that we needed to complain about. Overall I would rate this cruise a solid 8/10. Weather was a bit on the cool side and Atlantis seemed very uncrowded (we expected it to be packed on Dec 23rd). Had an issue at check-in where IDs for persons on the reservation were required. This was nowhere on the paperwork. It actually stated that the credit card of the person on the reservation was required. I had made both reservations and had my credit card and ID, but had put my daughter&apos;s name on the second reservation and she had left her ID on the ship. I had a photo of her ID on my phone, so they accepted that. The aquarium is pretty cool but can be seen in a relatively short time. Definitely not worth the cost of admittance. Overall fun excursion with good overview of the island. Some delays at the start (buggy would not start and was ultimately replaced) and End (took a while to get picked back up). Great Dive Operation. Spacious boat with lots of shade. First stop had plenty of reef sharks. Dive master (Austin) fed them (and a spotted eel) Lionfish. Dive master was excellent, very encouraging to my wife who is still quite inexperienced. Allowed each diver to dive their air (did not make all return to the boat at the same time) while still assuring that everyone had a buddy and was safe. Overall great excursion with close encounters with sea turtles and iguanas. Couldn&apos;t go to the "prime" dive spot due to strong winds and high seas. Diver masters were excellent.